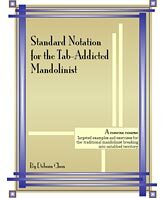 Debora Chen's book, "Standard Notation for the Tab-Addicted Mandolinist", originally released at the 2007 Mandolin Symposium at UC-Santa Cruz, is now available on for wider distribution. Standard notation is musically logical. This book will systematically guide you through navigating the staff in a musically intelligent way instead of relying the cumbersome mnemonic concerning the fate of "every good boy". The book is designed for traditional mandolinists who have played long enough to acquire a tab-addiction and who already have familiarity with the instrument and certain terms. Although it is not designed as a method book for beginners, it can be used in that way by an industrious beginner who, wishing to avoid tab entirely, doesn't mind looking up the details on how to hold/tune the instrument elsewhere. All the exercises are highly idiomatic to the mandolin and simultaneously encourage good technique in both right and left hands while giving you the necessary skills to break away from tab and into any 'fakebook'/tune anthology you choose. As you work through the book, you will learn to read, without tab, easy exercises followed by several progressive variations (utilizing both cross-picking and chord melody) derived from "Simple Gifts", and Beethoven's "Ode to Joy". Also included are adaptations from J.S. Bach's Partita III for unaccompanied violin and Cantata 147, Vivaldi's Concerto in C and several original jigs/reels composed to highlight easy note recognition. All materials in the book are carefully arranged/composed to 1.) exploit idiosyncrasies of the mandolin that make it, arguably, the easiest of all instruments on which to learn to read the full range of treble clef, and 2.) speed you on your way to comfortably reading anything you want. This book will show you how to get there. It's easier than you might have imagined.